The What: Radial Engineering has begun shipping the Jensen Twin-Servo 500 series preamplifier. The What Else: The Jensen Twin-Servo is a remake of Jensen’s 990 op-amp. According to Jensen's CTO Bill Whitlock: "When Deane Jensen first put his mind to building the finest microphone amplifier possible, the development process began with the now famous 990 op-amp. Part of the magic was maximizing the gain-margin so that no matter what the input, the lowest possible distortion would be realized. The unique design essentially cruises along in Class-A mode and then transitions to Class- AB only when pushed to extremes. In order to eliminate phase shift, all capacitors were removed from the signal path and replaced with servos. The 'unlimited bandwidth' enables the design to reproduce signals from DC to light…Working with the Radial design team, the Jensen Twin-Servo 500 has been faithfully reproduced following Deane's original recipe and has been adapted to fit the 500 series format." The Bottom Line: The 500 series version is able to deliver up to 60dB of gain. It features a convenient front-panel Neutrik Combo connector with choice of XLR and 14-inch inputs, a dual-gang potentiometer for level adjustment along with a 10 segment LED meter for viewing. This is supplemented with a 180-degree polarity reverse switch that toggles the absolute phase, a gentle high-pass filter to eliminate excessive resonance, a -15dB pad, and a 48V phantom power activation switch. 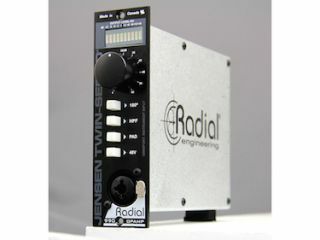 Made and distributed globally by Radial Engineering, the design follows Radial's traditional standards with all-steel construction, rugged powder-coat finish, a fully enclosed back box and dual-sided gold contacts for positive connection to the 500 series back plane.